There was an attendance in excess of 160 present. This Charity is the first one in Ireland dedicated to Marfan Syndrome Research. The Charity has raised a staggering €35,000.00 since last October for Research. The Foundation was set up by friends and family of the McGrath family from Kilmacow, to raise awareness about Marfan Syndrome and to raise funds for Marfan Syndrome Research. The Foundation has a very positive outlook and this is evident in the enthusiasm of the dedicated committee. The foundation enjoys tremendous support from the wider community. The funds are directly channelled through Prof. Redmond, Cardiac Thoracic Surgeon, Mater Hospital, Dublin. Marfan Syndrome is a connective tissue disorder. Connective tissue holds the body together. It is found in every organ in the body – blood vessels, bones and joints. In Marfan Syndrome, fibrillin (found in connective tissue) is defective, making the connective tissue weaker. Marfan patients are usually very tall (but not always) and have extremely long fingers and toes and lax joints that bend more than other people. It is estimated somewhere between 500 and 1000 people are affected in Ireland. Marfan Syndrome is hereditary. There is a 50:50 chance of a parent passing it on to their child but 25% of all Marfan cases occur spontaneously. The most serious complications of Marfan Syndrome affect the heart, aorta and the aortic and mitral valves. Marfan Syndrome may also affect the lungs, bones, joints and eyes. Professor Mark Redmond, Cardiac Thoracic Surgeon, Mater Hospital, Dublin and Our Lady’s Childrens Hospital, Crumlin, Dublin. Dr Kevin Walsh, Cardiologist, Mater Hospital, Dublin, and Our Lady’s Childrens Hospital, Crumlin, Dublin. Nurse Rhona Savage, Specialist Marfan Nurse, Mater Hospital, Dublin. Professor Redmond spoke about the advances made in the treatment of Marfan patients as a result of the research carried out to date. Life expectancy has increased considerably with proper monitoring and treatment. He explained how the research is being carried out presently in Ireland. He stated that the funds raised by this Foundation will impact directly on the lives of people with Marfans and stated the importance of research. Prof. Redmond gained vast experience in the treatment of Marfan Syndrome at Johns Hopkins Hospital, Baltimore. U.S.A. The gene that causes Marfan Syndrome was identified in 1990 through research. The more progress is made through the research programme the brighter the future for the Marfan patients. Dr Kevin Walsh spoke about the importance of Beta-Blockers in the treatment of Marfans. He also emphasised the importance of continuous echos (echocardiogram) for the Marfan patient. Early intervention is vital as the aorta enlarges. Elective surgery is the key as opposed to emergency surgery, in order to minimise mortality. The importance in choosing a surgeon was also emphasised. There is a better outcome if surgery is performed by a surgeon with experience operating on Marfan patients. Dr Walsh also spoke about the continuing monitoring of the patient following successful surgery. Nurse Rhona Savage spoke on the social aspect of Marfan Syndrome and how it affects different members of the family. She also spoke about the setting up of the Marfan Clinic at the Mater Hospital, Dublin where all the specialists involved in the care of the Marfan patient will work together. The service has been fragmented to date. This is a major development for individuals and families affected by Marfan Syndrome in Ireland. Unfortunately, three of Geraldine McGraths’ siblings died from complications associated with Marfan Syndrome but this has made Marfan Syndrome Research even more important. Geraldine thanked Prof. Redmond and Dr. Kevin Walsh for her own and Kieran’s successful surgery. They both enjoy a good quality of life. Geraldine and her husband Michael face the future with confidence knowing their family is in the care of the best possible medical team. She also thanked the hardworking Marfans Research Foundation committee that works so hard and who also support the family. Jodie Murphy, Chairperson of the Marfans Research Foundation Committee introduced the speakers and spoke about the progress of the Charity to date. Jodie presented a cheque for €15,000.00 to Prof. Redmond for research. 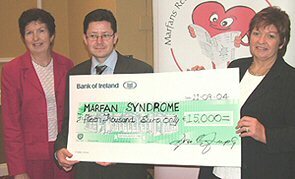 The Marfan Syndrome Information Booklet and the Marfans Research Foundation website www.marfansresearchfoundation.ie were launched simultaneously. There was a lively question and answer session. Many of the people who asked questions from the floor were Marfan sufferers themselves or members of the Medical Profession. The attendance included the press, local public representatives, local GP’s, representatives from W.I.T. School of Nursing, Cardiology Department W.R.H., Medical Consultants, W.R.H., and a medical Consultant from the Blackrock Clinic, Dublin. The launch of The Marfans Research Foundation Charity, the Website and the Marfan Syndrome Information Booklets was a tremendous success. The afternoon was informative and enjoyable in beautiful surroundings. 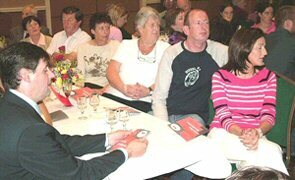 There was a large attendance and the Charity received excellent press. The level of awareness about Marfan Syndrome has increased particularly in the south-east and Marfan sufferers can only benefit from the inevitable spin off, as regards increased donations for research. The WLR and KCLR Radio Stations gave generous coverage as did The Munster Express, The Waterford Today and Kilkenny People Newspapers. The committee are receiving many congratulations and expressions of goodwill by post, telephone or email. The Information Booklets are welcomed by GP’s and Hospitals. The response is very heartening and gives the Committee the impetus to maintain the momentum. Super Value, Hypermarket, Morgan St, Waterford. Dunnes Stores, City Square, Waterford. Imelda Reid, Newtown, Kilmacow, Waterford.